Thanks to another premature listing on Spielwaren Bludau, our pals over at Brickset were able to update their already huge database of all things Lego. They have included new images from the City, Creator, Friends, Ninjago and Pirate themes. Nearly all of the sets slated for 2015 release now have at least box art images. 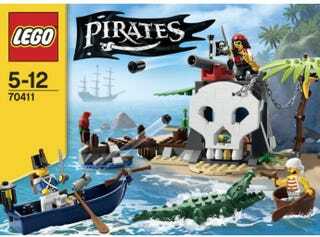 Included in the new stuff from the Pirates theme is the above Treasure Island (70411). Go-Kart (31030) - Will definitely be grabbing this. Toy and Grocery Shop (31036) - I'm super glad that they are doing more of these larger, almost modular size builds in this line. In the Ninjago theme, all of the box art is new to us. Check out the full line for 2015 here. Same goes for all the 2015 Friends stuff. As always it looks like a ton of new elements and new colors for old elements in these. Check out the full line for 2015 here.